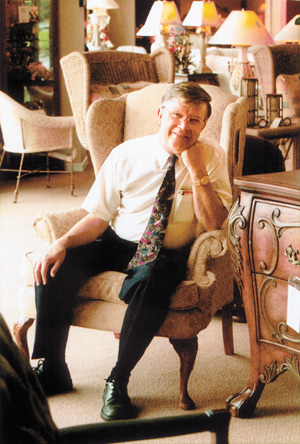 White’s Furniture is a family-owned business that was opened in 1957 by Mr. Arthur White. Through Mr. White’s vision and hard work, White’s has earned a reputation of showcasing fine quality furniture, world class customer service, and value in every purchase. Thousands of customers have made White’s their choice for all of their furniture, bedding and accessories. Arthur White has operated his business successfully by the “Golden Rule,” simply treating his customers the way he would want to be treated, and to this day, personally supervises its day-to-day operations. It is not at all unusual to find him talking with customers, finalizing a sale or checking to be sure everything is set up properly for a delivery. Arthur White of White’s Furniture & Accessories was voted the “Retailer of the Year” by the Florida Home Furnishings Representatives Association (FHFRA). The FHFRA was established 50 years ago and consists of over 250 home furnishings representatives throughout Florida. So if you want something more than a furniture store, a place where you are treated like family, you owe it to yourself and to your family to explore the possibilities White’s Furniture & Accessories has to offer! Stop by today! White’s Furniture & Accessories is one of the largest authorized La-Z-Boy Furniture Galleries in the region, so you are sure to find that recliner, sofa, sleep sofa, motion chair or other quality La-Z-Boy furniture you are looking for. White’s also has a 30,000 square foot warehouse so that much of the inventory is available for next-day delivery! Arthur White started White’s in 1957. Our staff of qualified professionals stand ready to help you with all your furniture and decorating needs. We invite you to stop by today and let us show you the “White’s Difference” when purchasing furniture or accessories for your home. *This credit card is issued with approved credit by Wells Fargo Financial National Bank. © 2016 White’s Furniture. All Rights Reserved.